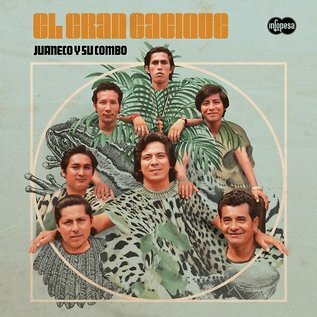 Infopesa present a reissue of Juaneco Y Su Combo's El Gran Cacique, originally issued in 1972. At the beginning of 1966, in the Amazonian city Pucallpa of Peru, merchant and musician Juan Wong Paredes decided to form a group to share and play some upbeat music throughout the city. Wong Paredes, of Chinese ancestry, enjoyed playing music with his accordion, especially at the Peruvian jungle parties known as tahuampas. After finishing his military service, his son Juan Wong Popolizio decided to collaborate with his father's band, and was joined by his friend Noe Fachín, who took on lead guitar and composing duties. Popolizio and Fachín worked together to select six young natives from the area who shared their love for exotic music, rhythms, and modern tracks that filtered in from the Colombian and Brazilian borders. These musicians became one of the best psychedelic cumbia bands ever: Juaneco y Su Combo. El Gran Cacique is one of the most essential cumbia records ever made, and, after 46 years, this iconic album returns in a special vinyl reissue that will surely reignite the psychedelic craze again. Essential.